After receiving two feet of snow out of the latest spring storm to hit the Rockies, Arapahoe Basin Ski Area (A-Basin) announced this week that it will extend Colorado’s 2013-14 ski and ride season. The ski area, originally slated to cease daily operations on June 1, will re-open for at least one bonus weekend June 6-8, 2014 (Friday, Saturday and Sunday). Dave Camara shredding pow at A-Basin on Monday, May 12 (A-Basin photo). “If conditions remain favorable, and people still continue to be excited about skiing and riding this spring, our hope is to take this season even further,” said Alan Henceroth, A-Basin’s Chief Operating Officer. 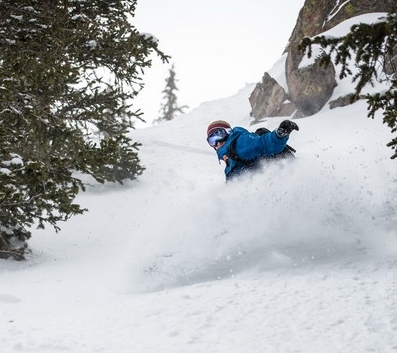 Since opening the season on October 13, 2013, Arapahoe Basin has received approximately 35 feet (419 inches) of snowfall through May 13, well surpassing the entire 2012-13 season total of 307 inches. In 2013, May brought 47 inches of snow to the Basin, and this May the ski area has already seen half of that amount. Currently, A-Basin is operating with an 80 inch base and over 80 percent open terrain. Guests should check the A-Basin terrain status page for up-to-date trail openings, as well as the A-Basin 411 page for information about skier services as the bonus weekend date draws closer. A-Basin will be closed for regular operations from Monday, June 2 through Thursday, June 5, 2014. Lift-served skiing will resume Friday, June 6 and continue through Sunday, June 8, 2014. If the season is extended further, regular operations will be on Fridays, Saturdays and Sundays only. Stay tuned to Al’s Blog, the A-Basin Facebook page and ArapahoeBasin.com for snow conditions, photos and information.